This hospital mattress 3500 series is our newest and most advanced foam mattress available today. The sculpted multi zoned top provides outstanding shear and pressure relief. The side of the mattress uses a firm rail to provide a gentle reminder when the patient is nearing the edge of the mattress. Premium foam ensures each cell absorbs the body and critical bony prominences without any additional resistance from surrounding cells. This allows for optimum pressure reduction. Our zoned sleep surface has multi sized cells to accommodate the varying sized bony prominences. This hospital bed mattress is the ultimate in static therapeutic mattresses. Outstanding pressure reduction to heal and prevent bed sores. Greatly reduced shearing effects to protect sensitive skin. Cooler sleep surface to prevent skin breakdown. Sculpted anatomically correct design. Ideal for use in hospitals, nursing homes, home health care and long term care facilities. Fits standard medical bed frames. This hospital mattress 3500 series is our newest and most advanced foam mattress available today. The sculpted multi zoned top provides outstanding shear and pressure relief. The side of the mattress uses a firm rail to provide a gentle reminder when the patient is nearing the edge of the mattress. Premium foam ensures each cell absorbs the body and critical bony prominences without any additional resistance from surrounding cells. This allows for optimum pressure reduction. Our zoned sleep surface has multi sized cells to accommodate the varying sized bony prominences. This hospital bed mattress is the ultimate in static therapeutic mattresses. Outstanding pressure reduction to heal and prevent bed sores. Greatly reduced shearing effects to protect sensitive skin. Cooler sleep surface to prevent skin breakdown. Ideal for use in hospitals, nursing homes, home health care and long term care facilities. Fits standard medical bed frames. Our newest most technologically advanced hospital mattress ever! This Contour Sculpted design provides outstanding pressure and shear relief. The anatomic construction will provide the best possible sleep surface for all of your patients. 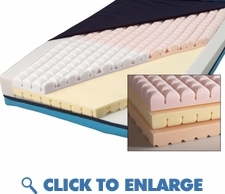 � Nylex Ultra Stretch top fabric allows the mattress to completely conform to your resident. This material is fluid proof, antimicrobial and flame retardant. � Exclusive anatomic Contour Sculpted Core provides �True Independent Load Bearing Cells� to completely cradle each and every bony prominence. These relieve pressure and shear to help promote the best possible skin care. A dual layer optimizes horizontal airflow to lower surface temperatures and reduce heat and moisture build up. � Advanced pressure reduction and protection in the vital heel section is obtained by using Densi-Sorb, a super soft foam technology. � Using Densiflex High Resilence Foams allows us to give one of the finest warranties on the market. Ideal for home health care and nursing homes too! Fits on standard medical bed frames.